Quickly the bad weather ceased and the land surrounding their village had already become summer. The young birds were already in flight. Dance ornaments representing birds, animals, and spirits hung from the ceiling of the qasgiq during winter ceremonies. 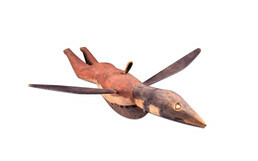 This hanging figure combines bird and human attributes, with a person’s body, a loon’s head, and wings. The creature’s chest opens like a toothy mouth, with a woman’s half-moon-shaped knife inside. The story behind this visionary imagery is unknown.